One of the secret pleasures and most amusing of activities in life, at least for some Mediterranean peoples is to shell and then peel fava beans, broad beans or habas as we know them in Spanish and eat the fresh content, the seed or kernel raw, accompanied with some bread and sometimes other ingredients like cod, cheese, ham, etc. My wife loves them and refers to them as an authentic delicatessen. Bear in mind though that you may catch a disease called favism which causes anemia but only if you are genetically predisposed. Try to tell that to locals in Murcia, Andalusia and other regions of Spain! In my opinion, you need some skill to peel habas or at least I see experts pile up a good amount of shells in the time I need to utterly destroy one pod. In the image, notice the beans inside the cardboard box and a bunch of pods right in front in the plastic container. This was taken early in the morning at one of those open air veggie stalls set outside La Boqueria market. The picture is almost ruined cause there was too much light and I didn't have much time to set the camera properly and still get away with my candid. I brought it here so you could see what peeling favas looks like and learn about the tradition behind it, a tradition as old as humanity itself and only second to good old lentils but that is part of another story. To illustrate the culinary aspect of fava beans here is a list of videos either about the plant or recipes that might give you new ideas for today's meal. Very interesting. I've heard of fava beans but can't recall ever eating them. Thanks for the post as I always like to hear about the culinary tastes of other cultures. What a beautiful image. 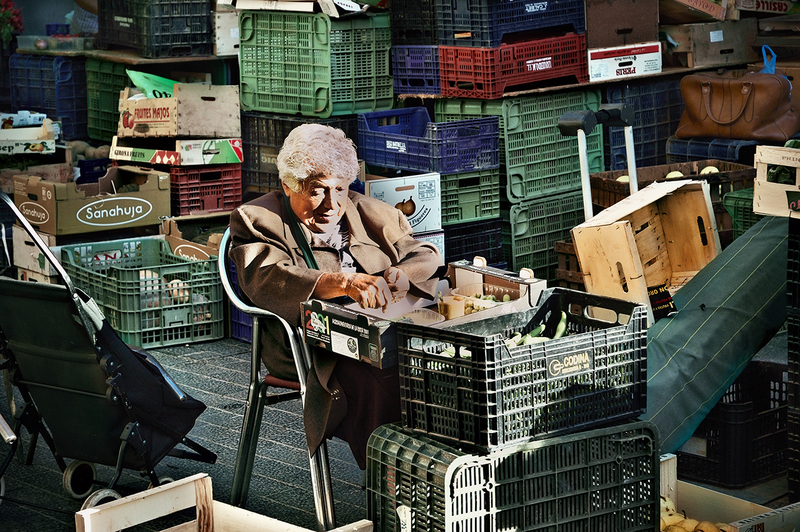 I love the man just sitting there peeling beans surrounded by crates. I kind of like the harsh light as well. Nice shot. wonder how long it takes to peel them?